The high level meeting stems from the Philippine initiative at the UN to mainstream disability in the millennium development goals and other internationally agreed development goals towards 2015 and beyond. In Secretary Balisacan’s opening remarks, he pointed out that disability remains largely invisible in most mainstream development processes, including the MDGs and something has to be done on a global scale. Philippine Permanent Representative to the United Nations Libran N. Cabactulan said the event is a “tremendous achievement for the Philippines” which, through the Permanent Mission, had tirelessly pushed for the initiative at the Third Committee of the United Nations General Assembly. “The Philippines believes in a truly inclusive growth and development for our world and this attention and focus on Persons with Disabilities at the highest level of leadership in the world demonstrates the resolve of our Government to work resolutely with other stakeholders to make further inroads,” said Ambassador Cabactulan. Since 2010, the Permanent Mission of the Philippines had been working on a series of resolutions to promote equal opportunities for persons with disabilities and to ensure an inclusive development agenda so that “no sector of society will be left behind” as the global community deliberates on the post-2015 development framework. The high level meeting, held at the level of heads of states and governments, highlighted the importance of the role of persons with disabilities in contributing to overall social and economic development and the need to ensure the full and effective participation of the one billion persons with disabilities in society beyond 2015. The meeting adopted an action-oriented outcome document which supported the aims of the Convention on the Rights of Persons with Disabilities and the realization of the Millennium Development Goals and other internationally-agreed development goals for persons with disabilities. The high level meeting included an opening plenary, two roundtable discussions and a closing ceremony. Among the speakers during the opening plenary were John William Ashe, President of the 68th session of the General Assembly; Ban Ki-moon, Secretary-General of the United Nations; Maria Soledad Cisternas Reyes, Chair of the Committee on the Rights of Persons with Disabilities; Stevie Wonder, award-winning songwriter and musician, United Nations Messenger of Peace ; and Yannis Vardakastanis, President of the European Disability Forum. Secretary Arsenio Balisacan, Director General of the Philippines National Economic Development Agency (NEDA) co-chaired Roundtable 1 on “International and regional cooperation and partnerships for disability-inclusive development” with the Foreign Minister of Spain. A total of 67 speakers, mostly heads of States and Ministers, participated during roundtable discussion. These included UN Women and a representative of the World Network of Users and Survivors of Psychiatry. In his opening remarks during the roundtable discussions, Secretary Balisacan conveyed that the Philippines is especially pleased to see the high level meeting come into fruition. He said that the meeting provided a “golden opportunity” to ensure that in the post-2015 development framework, no sector of society shall be left behind. Secretary Balisacan also pointed out the need to bring much-needed visibility to mainstream disability in development processes. He said that the Philippines hopes that the disability and development outcome document adopted by the General Assembly will galvanize all Member states, UN agencies, civil society, academia, private sector and other stakeholders into implementing the concrete actions set forth in the document and forging stronger collaboration and partnership for a disability inclusive development. 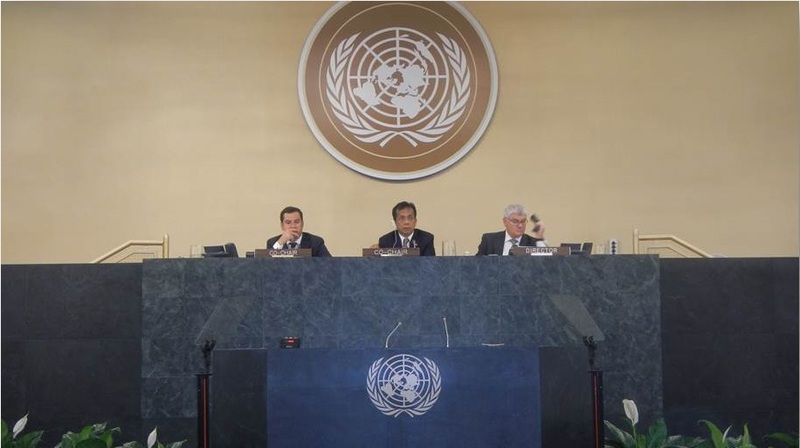 Negotiations for the outcome document were facilitated by Ambassador Cabactulan and Ambassador Fernando Arias, Permanent Representative of Spain to the United Nations. Aside from heads of states, ministers, UN officials and other stakeholders, more than 800 representatives of organization of persons with disabilities attended the event.